Good value and good quality gear cable. I prefer it to the PTFE cable which soon wears and clogs up making gear changes increasingly difficult. Simple cheap packaging for stowage...usually carry one cut to length for the rear mech just in case. It's Shimano so quality assured. Good quality with no real stretch issues once fitted. Easy to thread through cables and, if done properly, no annoying fraying. Buy a few and always have a spare or two to hand. Why not order some cable ends as well and you're set for a season or more. Good quality cable clippers are not a fortune either. I'm not trying to put your LBS out of business, but this is simple home maintenance stuff, especially if you have kids riding to school in all weather or you put in serious mileage. There are plenty of up-market alternatives with coated wires etc which may work better for high-end stuff, but this is basic, good work-horse stuff. Decent price and has made a huge difference to my shifting. 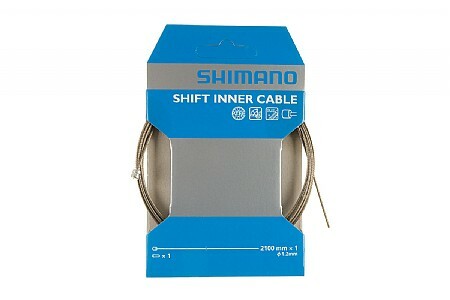 I have always used shimano cables. Does the job well. Bought this as a first timer cabling up my mountain bike ..can`t fault it, bought this as a separate item with gear outer...no problems. Over the years I have tried lots of different inner cables from the cheapest to the most expensive, and I always come back to these because for what they cost you cannot go wrong. Brought to replace my old cable, seems to be working like a charm so far, although time will tell how much it'll stretch. Good cable replacement plus this came with the end. Does exactly what is expected of it, great product. Great value. New casing and wire made my bike as new. Why spend more when you don't have to. Does the same job as any other more expensive cable which will be changed just as often. Good cable, can't see the point in paying too much for cables. More than enough length.